This has been an interesting week. I found myself with a serious problem. I had chilled a bottle of sparkling wine to have handy if we found ourselves in need of some bubbles. We normally have at least one in the fridge at all times. Having just finished our chilled split of Ruffino Prosecco the night before, we didn’t currently have anything open. My mother in law is in town and she likes to occasionally have a glass of wine with dinner, so I decided to open the next bottle of sparkling wine, a CA sparkling which shall remain nameless due to the issues it caused. It started like any other sparkling wine opening. Peel the foil, un-hook the cage, cautiously reposition bottle so one hand is on the top and the other is able to twist the bottom of the bottle. Normally what happens at this point with a properly chilled bottle of bubbles is that the cork gently pushes out with a quiet “pssssst” and we go on our merry way. This time the cork didn’t budge. It didn’t even move a bit! I gently twisted, then twisted a bit more and out came the cork but no hiss. Suddenly I realized that only the top part of the cork had twisted off, leaving the small compressed bit inside the bottle of wine. Several scenarios went through my head, none of them are advisable under normal circumstances and all come with a level of danger that I would not recommend to any person. Remember, sparkling wine bottles are a grenade in glass and I had just pulled the pin. 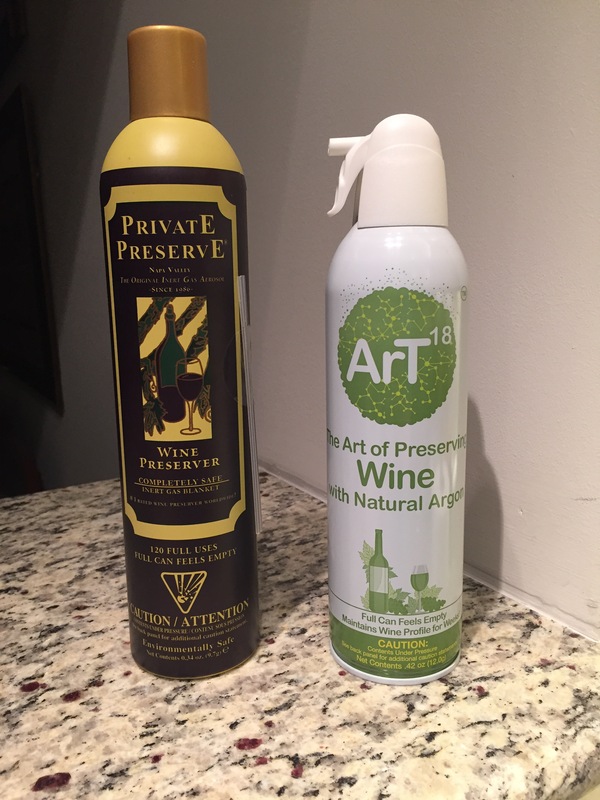 I quickly took the bottle outside in our back yard to prevent unnecessary damage to our home and then set about working on getting the bottle open. Pull the cork out with a corkscrew? No! This puts your hands and face directly in the path of the pressure coming from the bottle and is extremely dangerous. Not even I was that crazy! 2. Try to dislodge the cork by shaking the bottle. In theory, this should have worked. I pointed the bottle away from anything and anyone which could have been injured and shook vigorously. However, I was unsuccessful. 3. Bang the base of the bottle on something hard to dislodge the cork. I’ve seen this work for still wines so why shouldn’t it work for sparkling. I fully expected the cork remnant to come flying out. This was not the case and after denting our stairs, much to my husband’s chagrin since he just built them, I decided to reconsider. At last I was left with no other option. I could only saber the bottle open. There was only one problem. I had never had the guts to saber one open before. Of course, like any good wine professional, I knew the theory behind how to make it work but had never actually done it. I stocked up on safety gear such as safety glasses, an oven mitt, and my apron to protect from flying shards (or at least that’s what I told myself). I found our large chopping knife and then the seam on the bottle. I turned around to see my mother in law, son, and husband filming me. Fabulous! If I’m going to die, I might as well get it on video. I turned my eyes back to the bottle, placed the knife, and prayed. As I sliced up the neck, along the seam created by the mould, and hit the finish of the bottle. Off it popped and flew across the lawn. I had successfully solved the problem and my mother in law had her bubbles for the evening! However DO NOT TRY THIS AT HOME!!! Adult coloring books seem to be a strong trend lately. For my birthday this year, I found four of them on my desk complete with colored pencils and crayons from an anonymous co-worker. I took the hint and tried it out. Below was my first attempt. 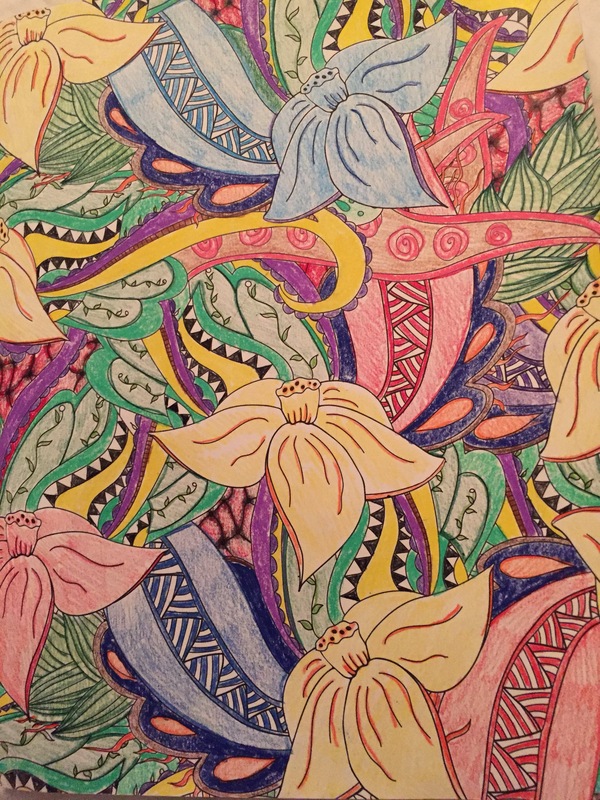 What began as an innocent coloring project immediately struck a nerve with my somewhat OCD tendencies. Why I started with a blue flower, I have no idea, but ultimately it ended up stressing me out completely as I tried to balance the colors to not have any one color be dominant. It also doesn’t seem to have any cohesive pattern so finding the patterns within the patterns while it was still black and white really didn’t become apparent until I was almost finished with the entire page. Then there was the pattern underneath the pattern which looked a little bit to me like satin quilting so I tried to get artistic with shadowing and shading and it just ended up looking a bit demonic rather than the plush satin texture that I was intending. The result which is a strange chaotic mess, in my eyes, is why as a winemaker I always have a plan to start. I always envision what the wine should look like at the end so that every step along the way has a purpose and a direction. This picture continues to stress me out just looking at it now but even as stressed as I was, I was driven to finish it. To see if, after everything started out strange and wrong, I could pull it back to something interesting. There are many times I’ve had to do the same thing as a winemaker and it is no where near as relaxing as an easy ferment but the sense of accomplishment at the end is a good feeling. The next one I planed out. It was a page full of leaves in black and white. Not wanting to do an entire page of green, I devised a story behind it to be right at the end of summer when it turns to fall and that first leaf starts to turn yellow and orange. 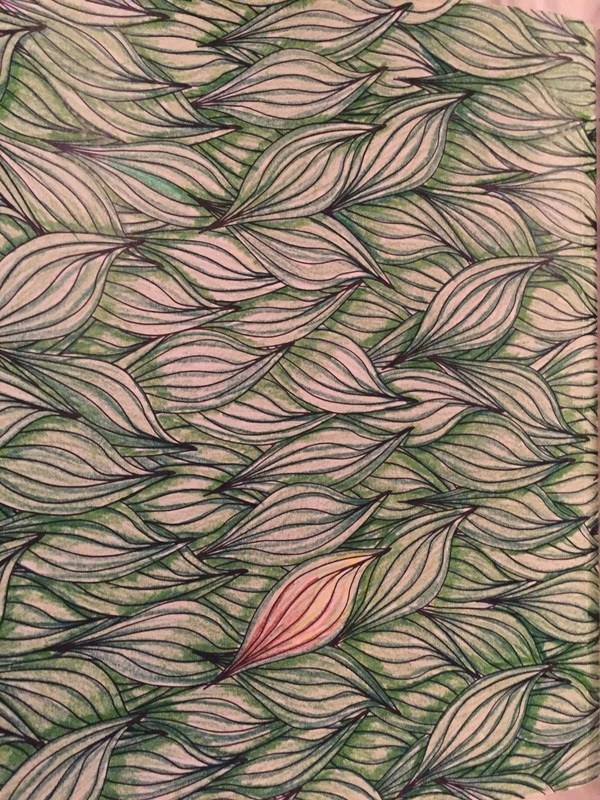 I picked the changing leaf and then worked on coloring in the balance of them with two shades of green in various shading patterns depending on leaf overlap. The result, unfortunately pictured sideways here since it was colored in landscape, was a relaxing study of leaves which had a clear plan. So note to self, if I don’t have a plan ahead of time, don’t start the drawing. The chaos of the non-plan will cancel out any relaxing benefits of the physical act of coloring.